Garapa has great properties – Our Garapa is kiln dried which makes it very stable. 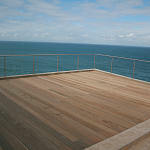 Garapa is insect and rot resistant, easier to work with than some other hardwoods, it lasts an exceptionally long time. 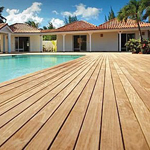 This wood is quickly becoming an alternative for those who don't like a darker hardwood like Ipé, but still want a good quality, stable, sustainable project wood for a good price. Insist that your Garapa is kiln dried to avoid any shrinkage or movement. 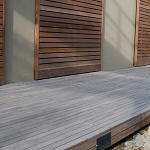 If you prefer the look of having a deck with no visible screws then this option is for you.